This design is the perfect home for a growing family. 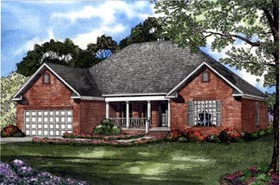 Either full brick or siding is available depending on your desired style. High ceilings are used in the foyer, dining room and great rooms also accented with round eight-inch columns. A roomy kitchen has bar seating and a view of the great room fireplace and adjoins a breakfast bay. The spacious master suite is set apart from the other bedrooms for the ultimate in privacy as well as luxury.